Comitan and neighboring San Cristobal de las Casas and Tuxtla Gutierrez are in the state of Chiapas, a region east of Oaxaca and south of Villahermosa and which is, without question, among Mexico’s most stunning scenic areas; mostly wild and rugged, it is rich in indigenous life and culture. Chiapas’ thickly wooded jungles, mountains and valleys together with its traditional cultures and indigenous roots have kept its look, feel and style very distinct from the rest of Mexico. Although there are some cities, symbols and events here which reveal the area’s colonial heritage, the population remains close to its indigenous roots. Life is still lived according to custom and ritual. Many argue that the natural beauty of this area has no parallel in Mexico: deep green forested valleys, awesome waterfalls and high mountains with deep canyons and gorges, a colossal wealth of flora and fauna and glorious lakes certainly make this area one of Mexico’s most unspoiled natural paradises. Away from the larger towns, Spanish is a second language; people here still retain their indigenous culture and tongue. You’ll see a lot of indigenous people going about their everyday life, often wearing their traditional dress. It’s important to remember that the people who live here are extremely sensitive to having their photograph taken, so exercise caution in this respect when you visit. See Practical Information for more details. Comitan de Dominguez is its full name, although it’s most often referred to as just Comitan (koh-mee-TAN’), was first settled around 1527 by the Spanish, and is still largely undiscovered by most foreign visitors to Mexico’s Chiapas region, who traditionally arrive and explore the region from San Cristobal de las Casas, 88km (55 miles) north of here. This has been partly due to the lack of road and tourism infrastructure, although in the last few years progress has been made in both areas and today Comitan is a good base to explore some of Chiapas’ most breathtaking natural attractions. The colonial city is made up of nine neighborhoods; an important reference to the city’s ancient name: Balun Canun, which means place of the nine stars. The houses are simple but picturesque, with their painted wood doors, interior courtyard gardens and colonial balconies. The streets themselves are well kept and immaculately clean, too. Comitan is the last significant place before Mexico’s southern border gives way to the Usumacinta River and Guatemala just beyond. Comitan offers its visitors a number of attractive sights inside the city itself, including the beautiful neighborhood of San Caralampio. See Key Attractions for more details. Although San Cristobal de las Casas is still the epicenter of tourist activity in Chiapas, Comitan has evolved and improved its tourism services, now making it an ideal place to spend a couple of days exploring the southern edge of Chiapas as well as the attractions along Mexico’s southern border with Guatemala, most within an hour’s drive from here. Comitan’s main plaza (also known as the Zocalo) is an attractive, multi-level mix of benches, trees and art sculptures; there is also a fountain on west side. Immediately off the main square you’ll find Church of Santo Domingo, the Casa de la Cultura (House of Culture) as well as the city’s main municipal building. It’s worth wandering around here and discovering the small shops and boutiques, many selling locally crafted items. This church, situated on the main plaza, was built during the 16th and 17th centuries; its attractions include a neoclassical facade and block tower that reflect Mudejar art. Inside the church is a single level, with two chapels added during later periods. The main one—made of marble —was installed in 1956 to mark the church’s 400th anniversary. The picturesque neighborhood of San Caralampio, three blocks northwest of the main plaza is a true delight. See Photo Gallery. Just off its central square featuring trees and a bandstand is the Temple of San Caralampio, built in 1852 to commemorate its patron saint following a cholera epidemic that devastated the local population of Comitan during the 19th century. 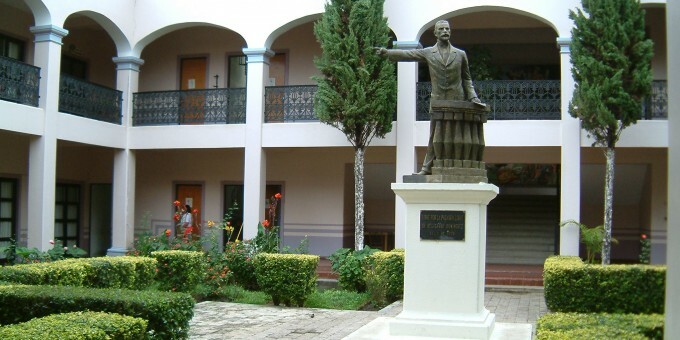 Museum of Dr. Belisario Dominguez – The former home of the Doctor/Martyr after which the town was named can be found one block southeast of the main plaza. This is a typical 19th century house with delightful balconies and gardens which complement the historic architecture of the building. Dr. Belisario was an outspoken senator during the presidency of Victoriano Huerta. After he spoke out against Huerta’s record of sponsoring political murders, he was himself murdered. The house has six rooms which give an insight into the life and times of Dr Belisario Dominguez. Casa de la Cultura (House of Culture), on the southeast corner of the main plaza has a small exhibition of local history and culture, and by walking through it you connect to the Museo Arqueológico de Comitan (Archaeology Museum), which keeps artifacts from the area’s local archaeology centers. To see some paintings created by some of Mexico’s leading artists, including Rufino Tamayo, visit the Museo de Arte Hermila Dominguez Castellanos, two blocks southeast of the main plaza; Admirers of fine art should also visit the nearby Museo Parador de Santa Maria. See Attractions Close by to Comitan, below. Museo Parador de Santa Maria – An ex-hacienda that was built in the 19th century and left empty after the revolution, suffering serious decay. The property was acquired privately and meticulously restored to its early splendor; today it’s a restful hotel/parador, restaurant and museum which keeps some very fine sacred art and sculptures dated between the 16th and 19th centuries (some images of these can be seen in the photo gallery). Just 28km (17 miles) from Comitan, this museum/hotel is surrounded by unspoiled countryside and provides an excellent place to rest, eat and enjoy some fine art. The owners of the property grow their own organic coffee which is served on the premises and can also be purchased to take away. Archaeological Areas – Tenam Puente and Chinkultic are short drives away – see the respective guides on Mexperience by clicking the green links above. Lagos de Montebello – a region of lakes in southern Mexico, this natural attraction is just one hour from Comitan. There are over 50 lakes in the area, most of them reflect deep turquoise blue and green. Don’t miss this spectacular area when you visit Comitan. Mexperience has published a Complete Guide to Lagos de Montebello as part of our Mexico’s Great Outdoors Section. Amatenango del Valle – On the highway between here and San Cristobal de las Casas is Amatenango del Valle: it’s a small hamlet that is famous for its local potters and pottery. The pottery here is still fired in the traditional way: by building a wood fire around the pieces, not in a kiln. Be sure to stop and see the array of pottery, and more recently, “animalitos” (little animals) on offer (although some of the animal pieces can be quite large, too). Prices are very cheap by western standards; some pieces are fragile, but they will wrap them carefully for you. Be sure to stop and buy. See the Picture Gallery for Amatenango del Valle. By Air – The closest airport to Comitan is at Tuxtla Gutierrez, the state capital. You can fly to Tuxtla Gutierrez from Mexico City. For detailed information about flights and flying, see the Mexperience guide to Air Travel in Mexico. By Bus – You can travel to Tuxtla Gutierrez on a luxury bus from Mexico City—the trip takes around 10 hours. 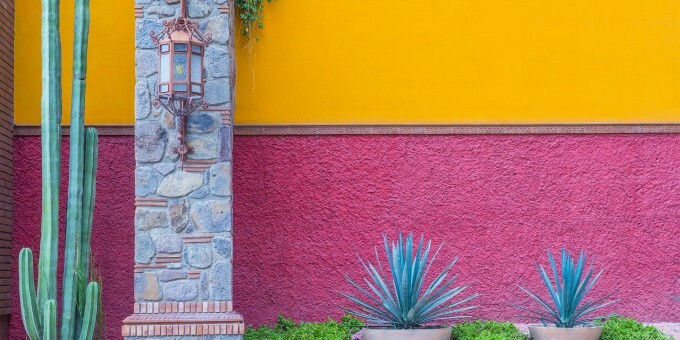 From there, take a local bus direct to Comitan or to San Cristobal de las Casas and connect from there. The bus you take from Tuxtla Gutierrez may stop at San Cristobal anyway—check locally. For detailed information about bus transportation read the Mexperience guide to Bus Travel in Mexico. By Car – Driving to Comitan from Tuxtla Gutierrez is pretty efficient now, especially as half the journey (to San Cristobal de las Casas) can be done on a high speed toll road. See additional information about Driving in Mexico and Mexico’s Toll Roads on Mexperience and further advice about driving in Chiapas in the Practical Information, below. Taxis – Taxis are plentiful in Comitan. Taxi travel is very affordable in Mexico in comparison to the USA, Canada and Europe, and so provides a viable means of public transportation in Mexico. Your hotel can arrange taxis for you; some post their rates on a board in the lobby; taxi hotel rates are usually higher than cabs you hail off the street. If you speak Spanish, you will have a distinct advantage in your negotiations with local taxi drivers. For detailed information, read the Mexperience guide to Taxi Travel in Mexico. February: Fiesta de San Caralampio – One of the most important festivals here takes place between February 11th and 20th— the festival of San Caralampio. See Key Attractions for information about the temple, food, music, dancing, flowers and local costumes, particularly children dressed in ‘little devils’ masks are paraded during the week; marking an important and busy time for Comitan. Exchanging Currency: Banks with ATM machines can be found in the downtown area of Comitan, with several banks and ATMs right off the main plaza. For detailed information about exchanging and managing your money, read the Mexperience guide to Money in Mexico. If you are driving independently in this region, using a rental car or your own vehicle, it’s important to follow some special advice. Military Checkpoints: Expect to pass through at least one, but probably several of these on your road trip through Chiapas. Don’t be alarmed, the soldiers may or may not check your car’s trunk; they are polite, respectful and can even provide local advice and directions if you need them. Special Note About Photography: The people in this region do not, as a rule, like photographs taken of them and the things they own. In some of the surrounding villages, it is prohibited to take photographs all together, and those who do not comply can face equipment confiscation, fines and even temporary detention. Ask before you take photographs of people and their possessions; you may be asked to pay a small fee for the privilege. See Also: Photography Etiquette in Mexico. Locally Hosted Parties – Check with yours and other local Hotels about public parties they may be hosting during your stay. Traditional Mexican theme night parties are popular with the locals, and there’s a chance you could join a really special night out – in a very traditional, local fashion. Hosted parties usually include dinner, dancing, a show and / or live music (usually authentic regional music and dancing) plus all drinks for a fixed fee and are always excellent value for money! Ask at your hotel to find out what is happening locally. Nightclub Scene – Comitan is a peaceful, laid back colonial city. Night life here is limited and if you are looking for this in particular, San Cristobal de las Casas will offer a better choice of night spots. Amatenango del Valle is a small hamlet famous for its local potters and pottery. The pottery here is still fired in the traditional way: by building a wood fire around the pieces and not in a kiln. Make sure you stop and see the array of pottery, and more recently, “animalitos” (little animals) on offer (although some of the animal pieces can be quite large too). Prices are completely affordable by western standards; some pieces are fragile, but they will wrap them carefully for you. Be sure to stop and buy; you’ll pick up some fabulous, unique and hand crafted pottery and make a significant contribution to the local indigenous communities. At an altitude of nearly 1,670 meters (5,500 feet) above sea level, Comitan enjoys a temperate climate and clean, mountain air. Evenings can be cool, as can winter months (Dec-Feb), so pack some warmer clothes in case the weather turns chilly. Rain can also be a feature, so pack a waterproof overcoat and hat.